I hit the lottery last Thursday. Not the one that pays cash, but the one that pays in amazing experiences. I got to help sail the Lois McClure, not as a canal boat, but as a sailing vessel. I teach sailing in Colchester, Vermont. Our school boats there weigh about the same as one of the nine huge ballast rocks that inhabit the canal schooner’s cargo hold. The rocks, in turn, represent barely a quarter of the mass of the mighty schooner. Fifty or so tons of wood, stone and iron add up to a far more stately ride than any little modern sailboat can offer. Raising the sails on a larger, nineteenth century schooner that lacks many of the labor saving devices on modern boats, requires about half a dozen crew, teamwork and a certain athleticism. The two larger sails – the mainsail and foresail – are four-sided assemblies topped by a heavy timber (the gaff). A team of two crew members haul up on each of the two top corners of the sail using lines called the peak and throat halyards, all coordinated by an observer (usually the first mate). Naturally, one more person is required to steer the boat, keeping her pointed into the wind. Sail-raising proceeds from stern forward to the bow. Once all three sails are set, the schooner’s sailing voyage begins. The boat’s motion is stately. Thanks to her boxy cross section, she heels (or leans away from the wind) far less than most sailboats. Her length and mass give her progress through the water a smooth elegance. Before Lois McClure‘s launching in July of 2004, no one had seen a canal schooner under sail in nearly a century. This fact guarantees plenty of company when our replica hoists sail. Recreational boats of all descriptions pace along beside her, orbit her or dart in for close looks. 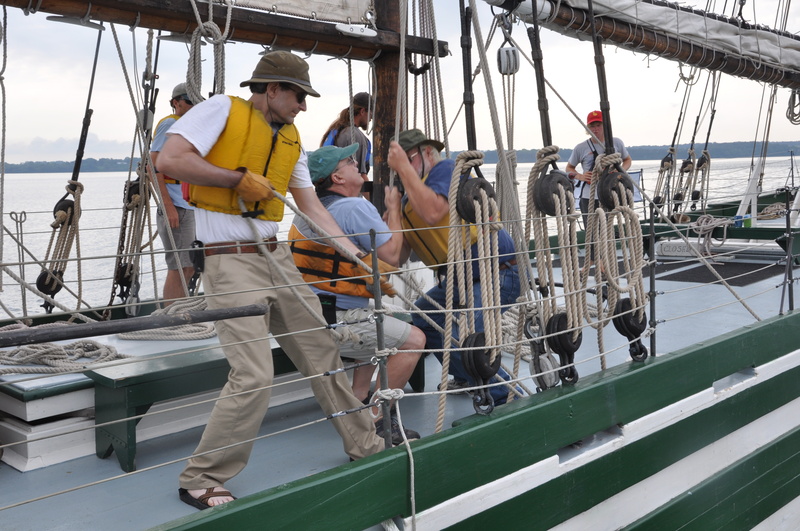 The schooner’s lack of a long keel (typical of other mid-19th century boats) makes her surprisingly easy to turn. Other schooners of this vintage must alter the pull of their sails (effectively turning the front sail, or jib, into a second rudder) in order to turn their bows through the wind. Lois simply pivots around her deep but narrow centerboard when turning through the wind. On a sailing vessel, your personal internal clock gradually resets itself. Traveling at speeds of under ten miles per hour is maddening in an automobile traffic jam. On the schooner, this leisurely pace is first soothing and ultimately just normal. You can imagine yourself as the owner-entrepreneur of the boat, confident that delivery of the cargo on board across New York State will happen on schedule.